11.10.10 The 9th Annual Wild & Scenic Environmental Film Festival has chosen On the trail as an official selection to be screened in Nevada City, California, January 14-16, 2011. Wild & Scenic has become the largest and most energized environmental film festival in the United States. I will be attending and hopefully so will Miss Snail Pail (artist Colleen Flanigan). A woman chasing down the common backyard snail is not a feat of speed. But Greg Young's 12-minute "On the Trail With Miss Snail Pail" is intriguing just the same. "No, no, keep them alive," snail-abatement specialist and artist Colleen Flanigan — a.k.a. Miss Snail Pail — tells a potential client over the phone. "Because I'm going to eat them." The film has surreally lovely images of Flanigan's "micro-livestock." 9.28.09 We just got back from the Modesto Reel Food Film Festival. What a wonderful event and turnout. Live entertainment, splendid deserts filling the lobby and even into the theater, fine films, and enthusiastic audience made a wonderful gathering. The 250 plus audience received "On the trail" with a warm response. I would highly recommend everyone to attend this one day festival next year. Festival directors Randy Siefkin, Bob Barzan, and Sue Richardson did a bang-up job. Colleen (Miss Snail Pail) is the featured member for Sept-Oct of ASCI (art and Science Collaborations, Inc). Take a look at Colleen's latest work and her ongoing projects, including the "Bio-rocker" a steel sculpture constructed at the Oregon Museum of Science and Industry which she hopes to sink to the ocean floor so that it may become a living sea sculpture thriving with fish. 9.8.09 "On the trail with miss snail pail" is going to be screened at two upcoming festivals. The 4th Annual Colorado Environmental Film Festival will screen On the trail November 5-7, 2009 in Golden, Colorado, and the Modesto Reel Food Film Festival with eight other films on September 28, 2009. Environmental and food issues are closely aligned and have become very political lately, especially food. Miss Snail Pail gently comments to a different way of thinking about food production for the decades ahead. We are making arrangements to attend both festivals. 9.27.08 This latest news has been neglected for some time. However, with the completion of "On the trail with Miss Snail Pail." it is about time for a little update. For more of what has been going on at Golden Bear Casting, check out the latest news for "Still Kicking." A documentary short about Colleen Flanigan, aka Miss Snail Pail, who has developed a career path that allows her to combine her artistic talents, stroll beautiful gardens, and put food on the table. Colleen is a snail abatement specialist and is passionate about our planet's future. The film follows Colleen as she gathers, grinds, cooks, and creates, and in the process we gain respect for the small gastropod, the woman who puts them in her pail, and alternative food sources. More about On the trail and Miss Snail Pail later. Please keep checking back as this site continues to develop. 10.30.06 Photos from the various screenings and film festivals of Still Kicking here. 7.27.06 Still Kicking has been chosen as an official selection of the 7th Annual Port Townsend Film Festival, September 15-17. It will be paired with a film called EMMA, about at 14-year-old bright, but troubled girl who begins to see her way into adulthood. 7.16.06 A screening for Still Kicking on the Monterey Peninsula is scheduled for September 27, 6:30 pm at the Sally Griffin Active Living Center, Pacific Grove. This special event is part of the "Art Knows No Age" series. Local guest artists will also present "Creating in the second half of life." An additional screening has been added: Wednesday, October 11 -- Carmel Foundation, Carmel, 2:30 pm. 5.08.06 A "Creative Aging" screening is set for September 17 at the Berkeley-Richmond Jewish Community Center. In addition to recently released "Still Kicking," two other films will be shown. "Let's Face It," a funny and poignant discussion among a group of friends, ages 45 to 60, about aging, and "A Specially Wonderful Affair," a wonderful film by Nathan Friedkin about old people in a nursing home writing songs with musician Judith-Kate Friedman. Both have screened at numerous film festivals the last couple of years. 3.29.06 Filming has begun on a character based documentary with a long shooting schedule; two plus years. The principle character wants to keep the project under wraps for now, but I can say lots of toe tapping music is planned. Another short documentary (10-15 min.) will start production soon. More on that one later. Still Kicking, six artistic women of Project Arts & Longevity was completed in early March. Amy Gorman and I visited some of the women to show them the film. You can get updates on all the women in still kicking's latest news. The two minute trailer can be viewed here. Amy Gorman's book, Aging Artfully, Profiles of Bay Area Women Artists Over 85, with photos of their lives, will be published this summer, 2006.The book includes a CD of songs about seven of the women, by Frances Kandl. For information click here, 510-527-4977. 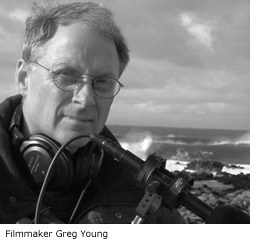 Greg Young retired in 2002 after 27 years as an award winning graphic designer for the University of California, Berkeley to pursue his passion for documentary films. His second documentary, Still Kicking, reflects his interest in character driven subjects. Shooting hand held allows Young more intimacy with his subjects, and gives him the ability to be less invasive. "Right now I enjoy making small canvas documentaries that reveal human qualities we develop as we get older." Young lives and edits from his home studio in Pacific Grove, California.